Donegal are planning for the summer without the services of Yvonne Bonner. 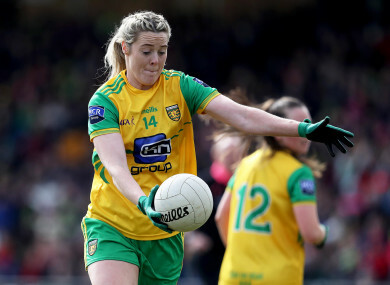 MAXI CURRAN’S DONEGAL have been dealt a blow ahead of the business end of the ladies football season as they plan without star forward Yvonne Bonner. The Glenfin ace recently completed an excellent first AFLW campaign with Greater Western Sydney (GWS) Giants Down Under, and it was hoped that she’d be back to don the gold and green of her native county for the latter stages of the league and championship. But after an initial report in The Donegal News stated that she has decided to stay on in Australia, The42 can confirm that the Ulster champions are planning for the summer ahead without her services. Bonner was a team-mate of Mayo legend Cora Staunton at GWS over the past few months, having landed a deal off the back of the CrossCoders programme. Before trialing in Melbourne, the 32-year-old had not played AFLW but impressed from the get-go and her star continued to rise week on week through the league. She rounded a glittering campaign with the Giants’ Goal of the Year accolade, making it two-in-a-row for the Irish after Staunton scooped the award last year. With the re-signing period underway at the minute, it’s not yet known whether Bonner will line out for a second campaign. While she impressed in Oz, her Donegal side won five of their seven league outings and finished fourth in the table to seal a last four clash against Galway this weekend. They had the dream start to 2019 with a win over All-Ireland champions Dublin in Croke Park — the first of four straight wins — but losses to Cork and the Tribeswomen followed. Captained by Bonner’s Glenfin clubmate Karen Guthrie, Donegal are on the hunt for their third consecutive provincial crown this summer, plus they’ll hope to go one further than last year’s first-ever semi-final in the All-Ireland championship. Email “Blow for Donegal as Curran's side plan for business end without AFLW star Bonner”. Feedback on “Blow for Donegal as Curran's side plan for business end without AFLW star Bonner”.